Been doing some marquetry since I mounted a laser on my machine. It is a 2.5W blue light. Not the worlds fastest cutting, but it does a nice job and most of the programs only run a minute or so anyhow. One of the challenges of doing marquetry is drawing up all the vectors and making sure the edges line up correctly. Prior to a recent discovery that meant a lot of cutting, clipping, pasting, rejoining, ad nauseam. Did not make for a whole lot of fun, just way too tedious. Ok, before I go on I want to make something perfectly crystal clear. I am a huge fan of Vectric products, have been for over ten years. But I have been around long enough to know that there is no such thing as the perfect software program for doing this type of work. No program does it all. Vectric has made sure that their software will interface with other products so that we can have the best tools for what we are doing. Ok, that was pretty darn clear. I use the heck out of Corel Draw. I bought Corel 1.0 and have been using it ever since, that is about 28 years now. Even though I have used it that long I continue to discover things about it that I did not know. That happened recently with a tool call "Smart Fill". I had thought it was just for filling objects with color. Well, it is way more than that and works great for creating marquetry. There are probably a few other programs that do it too, like Adobe Illustrator, but I do not have them so I have no idea if they do. But most of these folks make sure they match features to be competitive. The video is also informative as to how to trace a raster image without driving yourself nutz in the process. Hope everyone enjoys the video, it is about 43 minutes long. At 9:30 I start showing the smart tool in operation. I wanted to show someone who has never attempted marquetry before the entire process so that added to the video length. Great video, Ted. Lots of good tips, I learned a lot. When cutting the veneer, did you leave any allowance so the parts fit flat with no interference with each other? I learned Marquetry using the double bevel technique on a scroll saw. Be tough to do that on a CNC. Mike-S wrote: Great video, Ted. Lots of good tips, I learned a lot. Allowance. Good question. The issue is the beam diameter. Tough to measure it so I have been floundering around trying different things. What I want to do eventually is be able to spec it like a regular cutting tool, then do the normal inside and outside cuts. I am thinking that this morning I will mill a 1 X 5 inch long pocket in a piece of scrap. Then carefully check that it is actually 5 inches long. After that, I will cut either 5 or 10 rectangles and see how they fit. That should tell me a lot about what the beam diameter actually is. Obviously the more rectangles I cut the better. WB: Yup, been there, done that double bevel technique. Works very nicely. Though I do not picture myself cutting those .125 eyes on a scroll saw and having a lot of success. This one has been wandering around my workbench for the last several weeks so it is looking a bit grubby. I ran the test for beam diameter. First cut a very accurate pocket 5 inches long. You can see the error on the left end. Because there are 10 pieces that is 10X the error. This is a good fit. Probably too good. On my next project I will run the parts with .007 diameter and see how it turns out. It is also important to figure out what the end mill that cuts the outer boundaries is actually cutting too. Hope this method helps other people. wb9tbg-- The double bevel technique is the exact gist of Paul Zank's V-Inlay Protocol for creating wood inlay with a CNC router. Zank's method uses a V-bit to create a beveled female engraving, and the same V-bit to carve a beveled mirror image of the engraving...if you haven't seen examples of what can be done with Zank's technique you should search around through the thread he started at this forum in 2006. My scroll saw has been gathering dust since learning the fundamentals of Zank's method. The V Inlay technique within Aspire is very useful and produces excellent results. However, there are some significant differences between that technique and one using thin veneers. The most obvious one is the consumption of material. Obviously trying to bevel cut .02 thick stock is not going to work very well. Much thicker stock needs to be used. Thicker stock dyed is problematic at best and if it can be found is quite expensive. High quality figured wood is much less expensive as veneer. The other challenge with the V Inlay technique is doing pieces that have parts that touch each other or are entirely within one another. That is just not possible unless multiple cutting sessions are used. A plus for the V Inlay technique is that there is not a faint black edge on parts. In some cases that is a benefit with laser cut pieces, but not always. I always keep in mind that all of this stuff is very subjective. It all depends on the effect desired. Well said, Treischl, your point about the thickness (or, rather, extreme thinness) of the material makes sense. I wasn't really aware of just how thin (0.02" !!!) the material you were discussing is. Your point about the thin black outlines sometimes obtained with laser-cutting reminded me that there have been a few inlay projects in my shop where the final workpiece would have benefitted from some of the inlaid wood having a thin black outline to enhance contrast between the inlay and the base wood. This has generally come up in multi-colored inlays in a fairly light-colored base wood wherein one of the images is done in yellowheart. I've been thinking about ways to get an outline around selected parts of inlay projects, including use of darkened glue or perhaps charring the male workpiece a little with a propane torch before gluing it up....if I ever figure out a good solution for what I' trying to do, I'll post it. I'm also eager to hear other members' thoughts on this type of problem, if it has ever come up before. laflippin wrote: I've been thinking about ways to get an outline around selected parts of inlay projects, including use of darkened glue or perhaps charring the male workpiece a little with a propane torch before gluing it up....if I ever figure out a good solution for what I' trying to do, I'll post it. I'm also eager to hear other members' thoughts on this type of problem, if it has ever come up before. 1) Using epoxy, coat the sides of the female part until you get a good thickness (lets say 1 or 2mm), let it dry, and then machine away the epoxy (using an offset based on the original shape of the female part), leaving the thickness desired for the outline, and then insert your male piece. This sounds good in theory, and would work with larger parts, but I think once you get very fine pieces, you would have to recalculate to make up for the thickness of the added epoxy. The downside to this is you would likely want to leave the piece on your machine until the epoxy dries, since it is very unlikely you will get the piece lined up precisely, and if you are only leaving 1mm (or less), any discrepancies would be glaringly obvious. Quick dry epoxy is an option, but some of them cure pretty darn quick, so might not work. 2) I was also thinking about using pigments or dyes in the glue, but I wonder if those would effect the strength of the glue. Unlikely, due to the small amount of pigment required. If one were to go this route, it would probably be best to use "regular" (uncoloured) glue for the majority of the filling, and then paint on the glue for the areas it's required. It would probably be beneficial to use a shellac (or similar) to create a seal so you don't get paint bleed (from the pigments in the glue). As an aside, I created a project that required 2 separate cutting paths, one with regular wood inlay, and then another to create the paths for epoxy. First I did the regular wood path, once that was completed (glue dried, milled/sanded flush with rest of the piece), I put the piece back on the machine. At the beginning, I created 2 reference points on the scrap part of the wood (and created a drill toothpath in Aspire for those points), and used a 30degree bit to make a shallow (1mm) hole, and recorded the exact values (I normally work in imperial, so I looked at the G-code to see where the center of the holes are (they are in metric), and recorded those exact values, and when I put the piece back onto the machine, I used those values to move the spindle over and used the 30degree bit to make sure they were lined up exactly, and adjusted the piece as required. One could also use the dowel method (as used for 2-sided machining, since its the same principle) to ensure proper alignment after the piece has been moved. After that, I did a second round of v-carving, this time to create the "trench" for the epoxy. I made it way too deep, thereby increasing the amount of epoxy, and also the cure time. 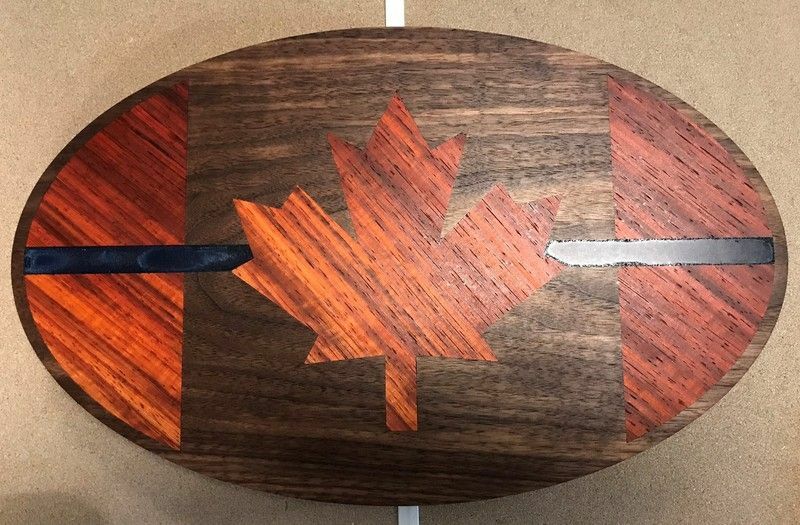 The maple leaf and sides are padauk, with main part being walnut. The epoxy and pigments (colouring and metallic) were all EcoPoxy (link). The epoxy looks horrible because I ended up having to pour it 3(!!!) times to get it to be just proud of the surface. The epoxy is supposed to be a dark blue metallic effect, to really jazz up the design. This one took a little bit of thinking, to come up with the best way to approach the cutting. I wanted to have clean perfect lines where the epoxy met the wood, so I was a little apprehensive about cutting into the areas that I shouldn't, if my alignment wasn't perfect. Thankfully, my initial planning (the 2 reference points marked onto wood) paid off, and the path that was cut was perfect: no extra wood to chisel out (which I had anticipated) or worse yet, I didn't cut into the areas that I shouldn't. I would really like to try these types of things on curved surfaces (think those wavy flags that people have been posting pictures of), but due to the nature of the Zank inlay technique, I can't see it working (the math/geometry would be crazy to calculate across a large, wavy piece), and it would be quite the challenge to pour the epoxy so it looks nice. You could do it in layers but that would take forever, and likely look horrible (or magnificent: it's art, baby!). 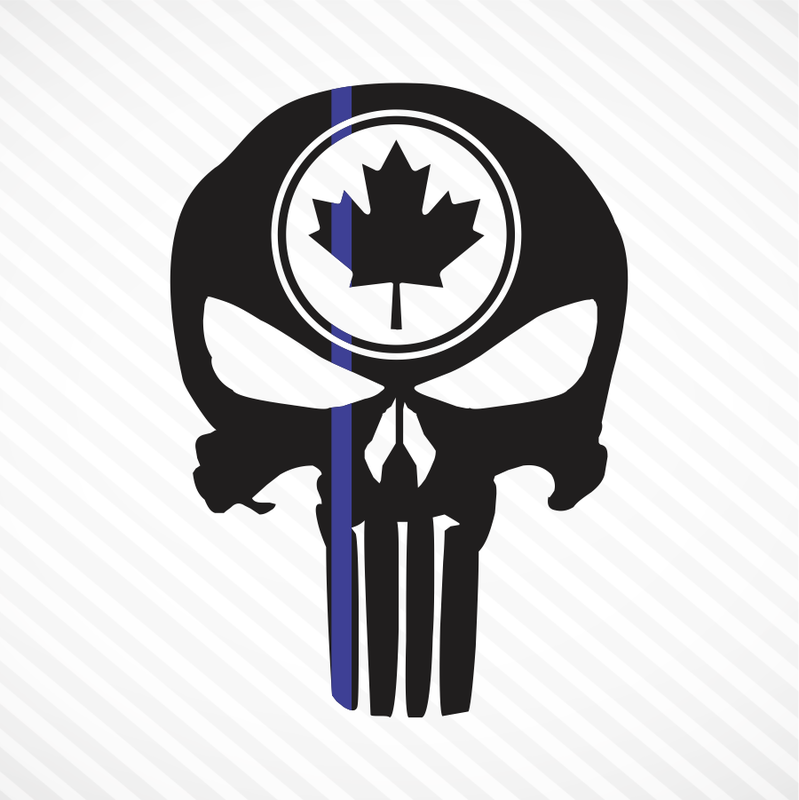 I want to do a Punisher skull (picture below), in 3D, with the blue line done in epoxy as per the one posted above. I have an idea of how to accomplish that (since it's fairly simple, compared to a waving flag), and I'll post that if/when I get around to it.